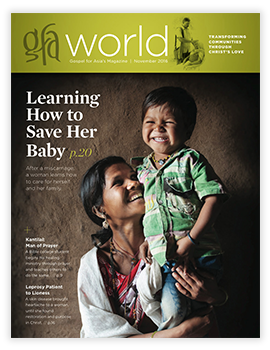 Here you can read the smaller articles from this issue of GFA World. Click the article line you'd like to read below to view the article. In this conversation, Daniel Punnose, vice president of GFA, shares about how important it is to maintain thankfulness in our lives. Sometimes I feel stuck in my walk with the Lord. I want to grow and experience times of refreshment, but I'm not sure what to do. What would you recommend? We often talk about wanting to grow in our faith, seek the Lord and know Him more, and I think one of the secrets to actually growing in faith is to be thankful, recognizing the hand of God in every situation in our lives. When Paul said, "rejoice in the Lord always, and again I say rejoice" (Philippians 4:4), he was in the perfect storm to have every reason to be ungrateful and complain. He was in prison, lonely, beaten, cold, suffering through incredibly harsh conditions, eating bad food, yet through all of that, he could see the Lord was with him. His heart and attitude was one of worship and thanksgiving. Over and over again, Paul challenges believers to rejoice and give thanks. This attitude of submitting all things into God's hands is from this deep assurance that God knows best and is always working things out for our good (see Romans 8:28). This amazing life God has allowed for us can be a constant joy, in spite of what may or may not happen, because we continually see God's hand in our lives through thankfulness. Why is being thankful important in our journey with the Lord? I have seen in my own life that when I practice thankfulness, my heart and my eyes are open to see God's hand at work in and through my life. When I complain or neglect thankfulness, I find that fear, worry and doubt fill my heart. Thankfulness leads to being able to live a life of consistent prayer and worship. We see this in David's life throughout the Psalms; no matter what he faced, he was able to see God's hand working, and his heart was lifted up in worship, praise, thanksgiving and prayer. Something incredible happens in our own hearts when we literally stop and say, "Lord, I thank You. I give You praise." Thankfulness helps us to see God's hand right now in our lives. Thankfulness keeps our hearts from losing hope, and hope fuels our faith to believe God for the things He will do and the promises He has made. What are the risks of not maintaining an attitude of thankfulness? One of the things that scares me is that if I am not aware of my own heart and I allow my heart to be unthankful—it will destroy me. The times I've probably been the most miserable are the times I've been the most unthankful. Most of us don't usually wake up one morning and just decide to be unthankful. It's something that happens over time, often without us realizing it. It starts with us neglecting to be thankful toward those around us, such as family, friends, coworkers, classmates and those who serve us in normal, everyday life, such as waiters, pastors, store clerks, etc. Neglecting to verbalize our thankfulness can cause our hearts to slowly become numb to what others have done for us. Over time, we disregard that anything good is even happening. Unfortunately, this attitude of our hearts eventually spills into our walk with God. Our prayers become thankless, and our hearts become cynical to the things of God and blinded to His goodness. As you read the epistles Paul wrote, you'll notice he has this ongoing habit of acknowledging and remembering people and what they have done to bless his life and ministry. He thanks them for all they have done, and you can feel the love he has for them. If we cannot be thankful for the small things in our lives and toward the people we see every day, it will be very difficult for us to trust the Lord, whom we don't see, and be thankful for His many blessings. How do we live this kind of thankful life? Here are a few practical things you can do to help direct you toward a life of thankfulness. Daily commit your life and the day to God's glory. Begin and end your day with a prayer of thanksgiving. If you find you don't know what to say or how to express it, use the Psalms to help you. Keep a running list of one thing each day you can be thankful for. At the end of each month go back and read through the list, and use it as part of your prayer and praise time. Avoid negative conversations that strip your heart of faith and praise. Try to encourage people around you with words and actions, and be a positive influence on social media rather than pointing out all the things that annoy you. Say "thank you" to the people you interact with each day, even if it's for something small. USA – Since its opening on July 7, around 400,000 people have streamed through the doors of a life-sized version of Noah’s ark, an attraction known as the Ark Encounter, located in Williamstown, Kentucky. Daniel Punnose, vice president of GFA, had the opportunity to experience the Ark Encounter before its official public opening. The Ark Encounter, owned and operated by Answers in Genesis (AiG), is a historical-themed attraction featuring a full-scale replica of the ark God commanded Noah to build before He sent the worldwide flood (see Genesis 6:14–16). AiG’s ark has three decks of teaching exhibits displaying various aspects of the flood account. Visitors become familiar with Noah and his family and learn about the days in which they lived and what it was like to care for a multitude of animals. The main purpose of the Ark Encounter, however, is to share the Gospel of Christ. Ken Ham, president of AiG, was the visionary behind the ark’s construction. This is the second attraction created by AiG, one of the largest apologetics ministries in the world. The first is its Creation Museum, which is located 40 miles north of the Ark Encounter. To learn more about the Ark Encounter, visit www.arkencounter.com. Virendra didn't have much confidence in ministry. He was in his second semester as a first-year Bible college student when he was assigned to teach a Sunday School in a nearby community. After two months, he and his fellow laborers faced opposition from angry villagers who wanted them gone. Virendra didn't know what to do. "I was very scared and very worried. I even stopped going," Virendra recalls. "But through Pastor Kantilal, I learned we should never give up. We should never compromise . . . when it comes to serving the Lord." Pastor Kantilal was a Bible college student in his third year then, nearing graduation. But his life had already impacted Virendra. Virendra would watch him fasting, praying and encouraging other students to passionately seek the Lord and spread His love. "He also personally used to talk to me and encourage me and tell me, 'We need to go and share the Good News. We need to become an agent in God's hand to bring these people [Christ's love],'" Virendra remembers. Encouraged by Pastor Kantilal and bolstered by a determination to follow the Lord, Virendra and some third-year students continued ministering in the village that opposed them. Today, because of their faithfulness, a group of people in this community have found hope in the Lord! During his time in Bible college, Virendra grew in his passion to share Christ's love with people and to make prayer a priority in all he does. When he prayed, his timidity began disappearing, and he saw amazing things happen. One day, as Virendra shared the message during a Sunday worship service in a village, he could sense the Holy Spirit's anointing. "I felt that the Lord had put those words in my mouth," he remembers. "People were listening very intently, and it was obvious people were touched by God's Word." After he shared, he watched the Lord spread His hand of healing on people's lives. Virendra prayed for a girl suffering from typhoid who had not responded to medical attention. He could sense the power of God working through him, and afterward, the girl was better. Virendra was later approached by a man named Sabal who had been antagonistic toward his ministry. Sabal asked Virendra to pray for a neck problem he was having, and God healed him! Impacted by this miracle, Sabal stopped opposing Virendra. Virendra is now in full-time ministry and continuing to tell others about God's love with confidence. He recognizes that unless he seeks God for His blessing and guidance, nothing is going to work. "I have experienced when we submit our activities into God's hand . . ., the Lord really prepares that place," Virendra says. "Not only does He fill us with His Spirit, but He also fills us with boldness and courage . . ."
Virendra entered Bible college shy and unsure. But as he was discipled and learned to seek the Lord in prayer, he became an enthusiastic witness of the grace of Christ. Surrounded by murderers, rapists, thieves. Separated from family. Living in cramped cells. Ailing health. Pastors Samuel, Roshan and Ugyen were in prison—for the sake of Christ. Thrown in jail under false accusations of being rebels or charged with "promoting civil unrest" for showing a film on the life of Jesus, these servants of Christ spent years waiting for freedom. They each went through heavy discouragement. How would their families survive? Will their young children remember them? What about the congregations they pastored; would they still grow in the Lord in their absence? Will they ever get out? But Samuel, Roshan and Ugyen each soon experienced a deep, unshakeable trust in the Lord and discovered their sentence into darkness was God's perfect will. Samuel, Roshan and Ugyen knew the men they were to spend the next years of their life with didn't know the love of Jesus. These were people who had committed heartless crimes—men whom Jesus loved and had died for yet who knew nothing of His heavy sacrifice to redeem them. So the three servants of God made their prisons their new mission fields. "The inmates in prison are not able to hear the Good News. No one can come personally here and tell them about Jesus, live with them and show them what a Christ-like life is," Roshan said. "When I understood that this is definitely the Lord who has brought me here, I began to thank the Lord for the opportunity He gave me again in ministry." Samuel, Roshan and Ugyen made the most of their confinement. They had time, plenty of it, to cultivate friendships with the inmates. They reflected Christ's grace and compassion, and the men around them began seeking them for counsel and desperately needed hope. In their separate prisons, these pastors started prayer groups and worship services. They taught from the Bible and saw hardened criminals made new in Christ. Whenever Samuel, Roshan or Ugyen struggled inwardly, they drew deep from the Word of God. "I was satisfied by the Word of God every day," Samuel said. "It was during my time in prison that the Lord personally and very closely touched my life. His promises became very evident and apparent to me." By the time these men walked out of their prisons, they knew God's purposes for their time of imprisonment had been accomplished. And they came out changed men: stronger, more courageous and assured that in their darkest hours, God is with them. The Lord says, "Remember the prisoners as if chained with them . . ." (Hebrews 13:3). Many of our brothers and sisters in Christ are imprisoned or face that threat because they've chosen to not keep silent and share the Truth in love. Let's pray for them and remember their chains, that they may be strengthened and encouraged to persevere and fulfill God's purposes. If I lived to be 120 years old and someone said to me, "You've served the Lord since you were 16. Now that you're older, what is the most important advice you can give to God's people for their life on earth in the light of the horrendous darkness and need of our world?" My answer would be very simple: "Be broken." Though I am only in my 60s, there is no greater truth I have learned in my journey with the Lord than the significance of embracing the life of brokenness. When it comes to our usefulness in God's work, the greatest problem that keeps us away from the life God has for us is not our failure, sin or lack of ability, but it's our stubbornness and lack of brokenness. God cannot work through an individual who is proud, defiant and self-sufficient. King David, for example, knew God so intimately, but when he chose his own way, as in the case of Bathsheba, he lived spiritually, mentally, emotionally and physically sick for a full year. He fought with everything he had in him to hide his sin and keep his image and honor intact. But in the end, he couldn't do it anymore; he was dying inside. In his confession, he declared and passed on to us what God is looking for: "The sacrifices of God are a broken spirit, a broken and a contrite heart—these, O God, You will not despise" (Psalm 51:17). Some of us are naturally gifted and able. As such, we are in great danger of walking through our life and doing great things for God—all in our own strength. Only in the end will we find out that in spite of all our accomplishments, God could not use us to impart Christ's tender, gentle, broken and creative life to others. No doubt our gifts and abilities are given to us by our Creator; however, they will only become useful in building God's kingdom if we walk in humility and brokenness, depending on His strength instead of ours. There is so little that God or anyone else can do for us as long as we manipulate circumstances, justify ourselves and fight every opportunity to be broken. The more we fight, the harder our hearts become. On the other hand, when we embrace brokenness, our hearts will become soft and pliable in the hand of God. When we meet Christians who are broken, we notice their tenderness and that there is no harshness or demand in them. We feel a sense of peace when we are with them, and we are not afraid of them. They may not say much, but we perceive there is something more than words and right or wrong that guides their lives and causes them to radiate God's peace. Jesus, who is Almighty God, embraced humility and brokenness to such an extent that the prophetic Scripture describes Him, saying: "But I am a worm, and no man" (Psalm 22:6). Because He was completely yielded to the will of His Father, He was able to lay down His life for us and become our Savior. Jesus desires that we cease from strife, walk in peace and produce eternal fruit. That's why He invites us: "Take My yoke upon you and learn from Me, for I am gentle and lowly in heart, and you will find rest for your souls" (Matthew 11:29). The only way we experience this rest is when we cease from fighting to preserve ourselves, and embrace brokenness. No one can make this decision for us; there is no shortcut. Books like Calvary Road by Roy Hession, Victory Through Surrender by E. Stanley Jones and my book Touching Godliness will be helpful resources to you in walking in brokenness. But please understand: Reading alone will not be enough. You have to make this journey for yourself. And when you are willing to take Christ's yoke upon you and embrace brokenness, the Lord will give you wisdom, guide you and walk right beside you. You will be surprised how peaceful your life will become! My dear friend, there is nothing more significant that I can offer you from my own journey than the counsel to follow the footsteps of Jesus and embrace brokenness.